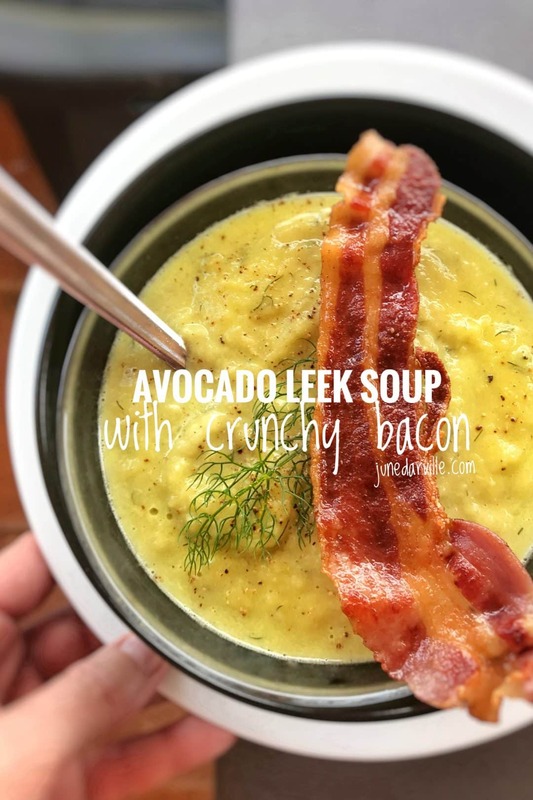 Leek Soup with Avocado & Crunchy Bacon | Simple. Tasty. Good. For this next leek soup we are only going to use the leek whites and light green parts. You can turn the darker greens into another soup (see below for my leftover leek greens soup). 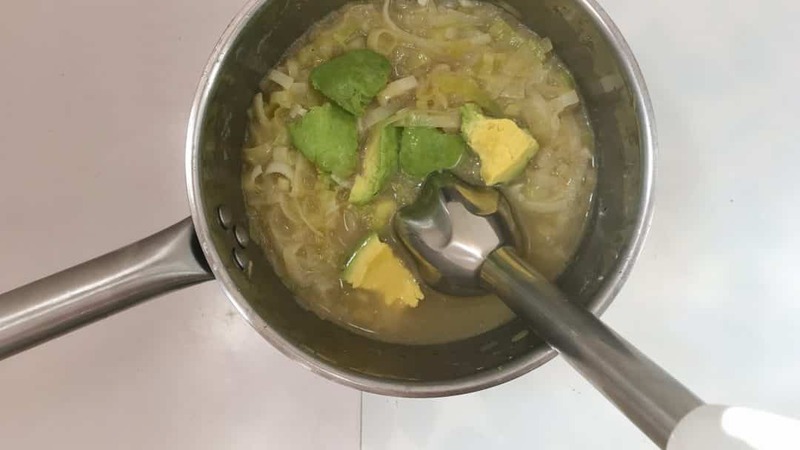 Have you ever added avocado to a soup? If not, you will do this more often once you try it because the avocado gives the leek soup a very creamy texture. So it’s also a great alternative for cream! One remark: add the raw avocado to the soup right in the end once all the other vegetables are cooked, right before mixing or blending the soup. Watch my video of how I’m preparing a silky smooth leek soup with avocado and bacon in my KitchenAid Cook Processor! 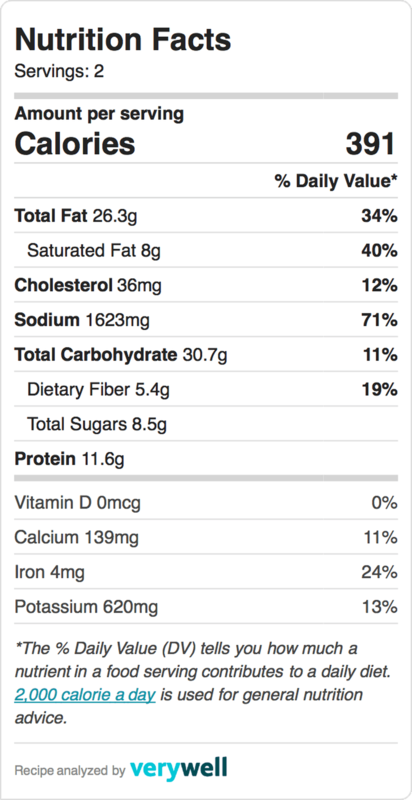 For the full step by step KitchenAid Cook Processor recipe just scroll down to the second recipe below! I found out by accident actually how creamy a soup becomes when you add a ripe avocado to it. A couple of weeks ago I was making a chicken pesto soup. This almost overripe avocado also had to be used that very day or it would have gone bad the next day. So I just scooped out the super soft avocado meat and added it to the cooked pesto soup. I was overwhelmed by the result! Check it out: chicken and basil pesto soup with avocado with bacon! 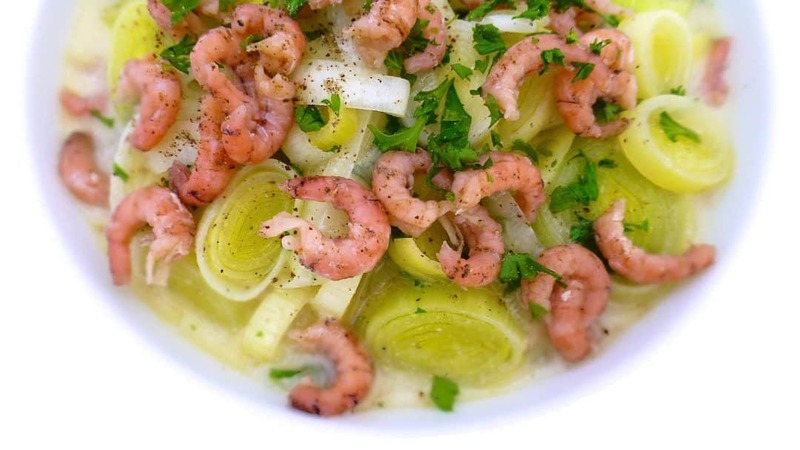 Also take a look at another leek soup from Spain: chunky porrusalda, a Spanish salt cod and leek soup recipe! 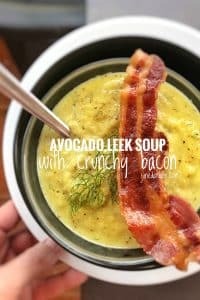 Check out this silky smooth leek soup with avocado and crunchy bacon! Peel the garlic cloves and the onion. Chop both up finely and add it to a large pan together with the bay leaves, the olive oil and half of the unsalted butter. Season with a pinch of pepper, nutmeg and salt. Place the pan over medium heat and gently stir fry the garlic and onion for 4 minutes. In the meantime slice the leek whites up finely and rinse them well under cold running tap water. Then add them to the onion in the pan. Give the leeks a good stir. Put a lid on the pan and let the leeks cook for 5 to 6 minutes. Then pour in the vegetable or chicken stock. Cook the leek soup for 6 to 8 minutes or until the leeks are soft. In the meantime grill or fry the slices of bacon until crispy. Remove the bay leaves. Peel the avocado and add the avocado meat to the soup. Mix or blend the leek soup until silky smooth. Check the seasoning and add extra pepper, nutmeg or salt to taste if necessary. Add extra butter to taste. Scoop the avocado leek soup into large bowls and top with crumbled crunchy bacon. Serve hot. 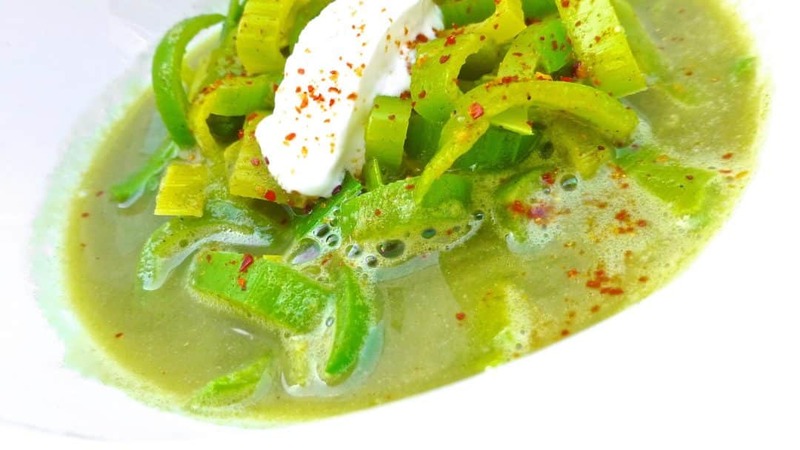 Here’s the full step by step KitchenAid Cook Processor recipe for this leek soup! Peel the garlic cloves and the onion. 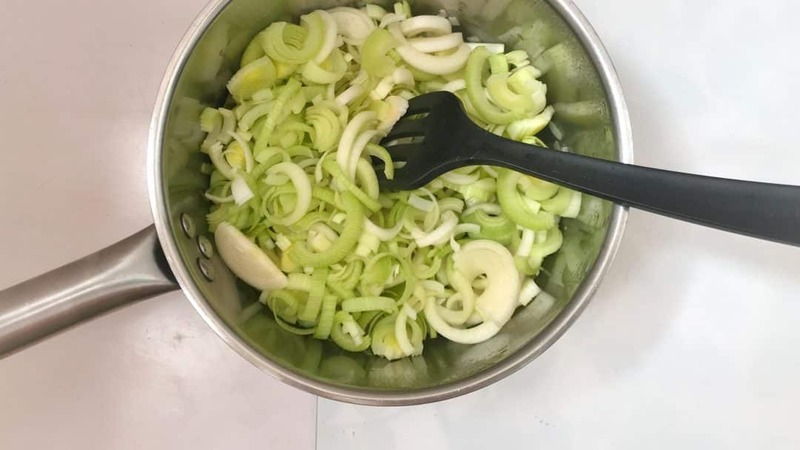 Chop the leek whites, garlic and onion into large bits and add them to the bowl of the KitchenAid Cook Processor fitted with the MultiBlade. Close the bowl and press Pulse for 10 seconds until you end up with a fine vegetable crumble. Scrape down the sides of the bowl and add the olive oil and half of the unsalted butter. Season with a pinch of pepper, nutmeg and salt. Close the bowl and select BOIL P2. Press Start to activate the program. After that, scrape down the sides of the bowl. Pour in the vegetable or chicken stock and add the bay leaves. Close the bowl and press Start to activate Step 2. In the meantime grill or fry the slices of bacon until crispy. In the end press cancel to exit the keep warm mode. Remove the bay leaves. Peel the avocado and add the avocado meat to the hot leek soup. Add the rest of the unsalted butter as well. Close the bowl and press Pulse for 20 seconds or until the leek soup is silky smooth. Check the seasoning and add extra pepper, nutmeg or salt to taste if necessary. Do you throw away leek greens? Next time think about turning them into an easy lunch or leek soup dinner! 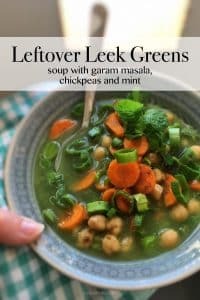 Try my veggie leftover leek greens soup below with chickpeas and hints of garam masala, curry powder and fresh mint! Whenever I need leek whites for a recipe, I will never ever get rid of the rest of this magnificent vegetable. I put it in my fridge for later where it can be stored for up to a week. Time enough to find some inspirational recipes! OK the outside dark green greyish leaves might become a little limp but they protect the fresher inside bright green leek leaves that we need! Besides, those toughest outside leaves I can use to make the base of this leek soup and blend them finely. The part of the leeks that is a little lighter and crunchier I’ll just slice up and add later on to the hot soup to give it some extra bite. Try my veggie leftover leek greens soup below with chickpeas and hints of garam masala, curry powder and fresh mint! Peel the garlic cloves and yellow onion. Chop both up roughly and add it to a large and high pan together with a good splash of olive oil. Place the pan over medium heat and gently fry the chopped onion and garlic for 5 minutes. In the meantime divide the leek greens into two parts: the toughest very dark green leaves at the end and the fresher and crunchier dark green part closer to the leek whites. Slice up the toughest parts and rinse it under cold running tap water to remove any sand. Then add the dark green leeks to the onion and garlic in the pan. Stir the ingredients well and gently fry the leek for about 5 minutes. Then add the vegetable stock to the pan and season with a good dash of pepper, a pinch of salt, the curry powder and half of the garam masala. Stir the soup again and then put a lid on the pan. Cook the leeks for about 20 minutes. Then blend the soup for 2 minutes until silky smooth. I used a stick mixer but you can use a blender if you have one. 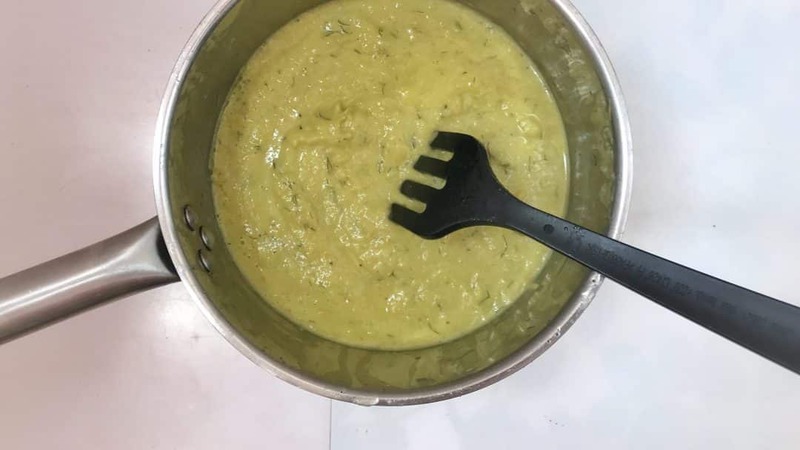 Strain the leek soup through a fine sieve to get rid of the thick fiber consistency and discard the green leek pulp that is left. Check the seasoning of the strained leek soup and add extra pepper or salt to taste if necessary. Then slice the fresher crunchier leek greens that you kept aside and rinse the leek under cold running tap water to remove any sand. Peel the carrot and slice it up. Add both leek greens and sliced carrot to the leek soup. Reheat the soup again over medium-high heat and let the vegetables boil for 8 to 10 minutes until tender and soft. Then add the drained canned chickpeas and the rest of the garam masala to taste. Simmer the leek soup for another 4 to 5 minutes. Check the seasoning one last time and adjust if necessary. 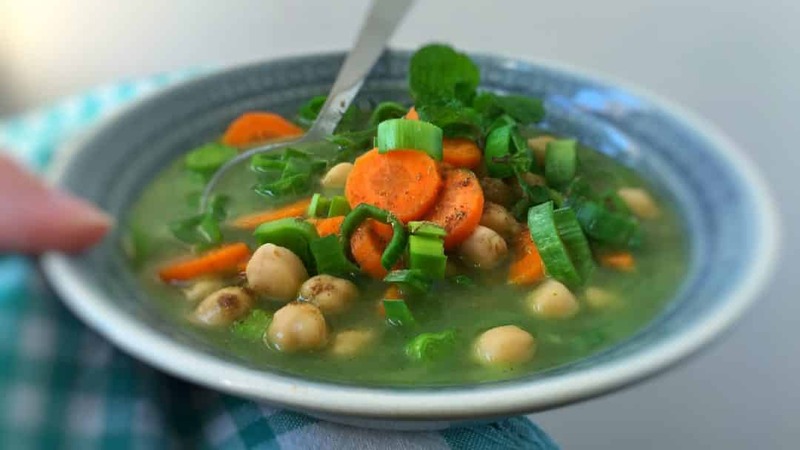 Then scoop the chunky soup into large bowls, sprinkle with the freshly chopped mint and serve hot. This leek soup was all I needed to turn the leftover tougher green leek parts into a simple but tasty soup. It’s surprising how much flavor you can still extract out of something that we normally throw away. Frankly I never like throwing things away that visibly have a second life in store. Look at the gorgeous turkey soup I managed to make from a carcass I saved the day before! Leeks have a very subtle taste so I tried to use very little ingredients to not overpower its flavor. I strained the vegetables to get rid of the less appetizing leek pulp before adding the softer parts. What you get is a very smooth and wonderfully flavored soup base. Rinse the leek leaves Separate the tough dark green leaves from the lighter inside leaves. Slice the lighter leek parts finely and rinse them again to remove any sand. Drain the leeks and up them aside. Add half of the unsalted butter to a large pan and place it over medium heat. Once the butter has melted, add the chopped garlic and fry it gently for about 3 minutes until fragrant. Don’t burn it. Shred or chop the darker green leaves up roughly and add them to the fried garlic in the pan together with the bay leaves as well. Season with a good pinch of pepper and salt. Stir well and cook the leeks for about 5 minutes. Then pour in the vegetable or chicken stock. Bring it all to a rolling boil and then turn the heat down again. Put a lid on the soup pan and simmer the leek soup for about 25 to 30 minutes until the leeks are soft and tender. Then take the pan off the heat and mix or blend the leek soup well. Strain the soup in a fine sieve over another pan. Discard the green pulp that remains in the sieve. Reheat the leek soup and add the rest of the sliced leeks you put aside. Cook the leek soup over medium heat until the leeks are soft. Check the seasoning and add extra pepper or salt to taste if necessary. Then add half of the cream cheese and the rest of the unsalted butter and stir until it has fully dissolved. Transfer the leek soup into bowls. Garnish with a small tablespoon of cream cheese and a pinch of spicy paprika powder. Serve immediately. How we all loved this leek soup with white wine! Yep indeed, with wine. The wine gives this leek soup a very special flavor touch. And I’m not even talking about the cream, and most important here. The sprinkle of peeled grey North Sea shrimp on top! This is Belgian food at its best. Hey, you should really try that wine! I’m sure you can imagine it quite clearly: wine, leeks and cream. Perfect matches for the dash of ground nutmeg I also like to add here in this soup. I kept the cooked leeks quite crunchy. That bite adds an extra new level to this elegant dish. Starter or lunch soup, both sound great to me. No grey shrimp available? Then try adding smoked fish! 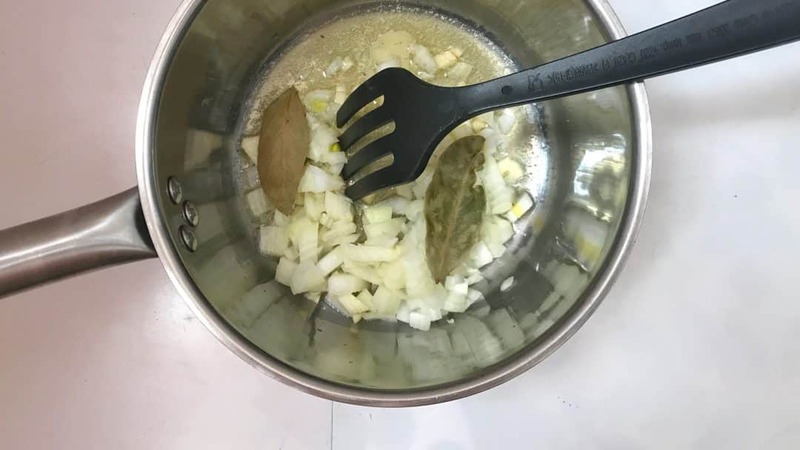 Add the unsalted butter to a large saucepan together with the bay leaves, the clove and the finely chopped garlic cloves. Place the pan over medium heat and let the butter melt. Gently fry the garlic for 4 to 5 minutes. In the meantime slice the white leeks finely and rinse them very well under cold running tap water. Drain them well for a minute and then add the leeks to the melted butter and garlic in the pan. Stir well. Gently bake he leeks in the butter for 5 minutes. Then pour in the white wine and the chicken or vegetable stock. Season with a pinch of pepper, salt ad nutmeg. Stir well and put a lid on the pan. 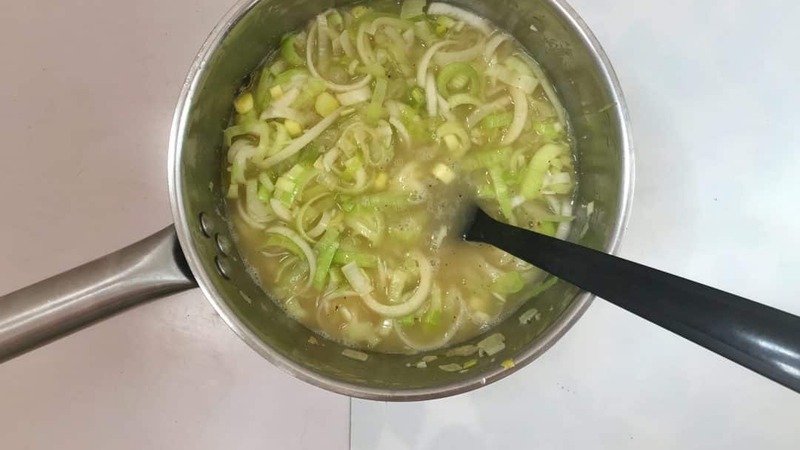 Cook the leek soup for 10 to 12 minutes until almost soft. if you want to keep the leeks more crunchy, cook them for a little less. Once cooked, stir in the cream. Stir well. Check the seasoning of the soup and add extra pepper, salt or nutmeg to taste if necessary. Remove the bay leaves and the clove. Stir in the freshly chopped parsley. Scoop the leek soup into bowls. Sprinkle with the peeled grey shrimp and a last dash of pepper. Serve hot.